Provence. How I love the city. It was so apropos for me to find a post card that was a love letter from another time. However, it left me with goose bumps when reading the card. It read, “The first time ever I saw your face, I knew I would always love you.” It mesmerized me and still does today. 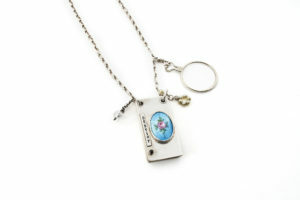 The blue guilloché charm with applied enamel on this piece captures the sentiment. For many years, I thought of this man and his love of this woman. Then, after giving birth to my first child, it made me think of the postcard, and I felt the same way about my daughter. Guilloché, pronounced gee-oh-SHAY, is from the French word meaning “engine turning.” It simply means “engine turning patterns” and refers to an ornamental pattern. Guilloché patterns can be seen in neoclassic architecture and banknotes ( in an effort to deter forgery). 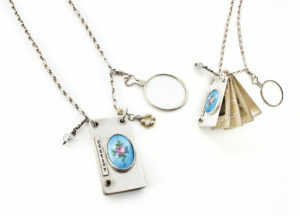 The technique as it pertains to jewelry making involves carving a design into a base metal. Enamel may then be applied along with decorative accents.